Dakoda Armstrong hopes to make an immediate impact for Richard Petty Motorsports. 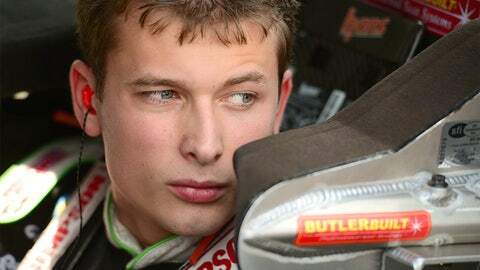 Richard Petty Motorsports has found its replacement in the NASCAR Nationwide Series for Michael Annett, as the team announced Wednesday morning that 22-year-old Dakoda Armstrong will drive the No. 43 RPM Ford Mustang next year and beyond. Although terms of the deal were not disclosed, the team said in a release that Armstrong’s "multi-year contract marks an ongoing commitment towards winning as the RPM team looks to build upon recent success." Philippe Lopez, who has been RPM since 2012, will continue as the team’s crew chief, with agricultural firm WinField as Armstrong’s primary sponsor for most of the season, and Fresh From Florida his primary sponsor for three races. Armstrong ran the full NASCAR Camping World Truck Series schedule in 2013, finishing 12th in points, with a best race finish of fifth at Talladega. He also ran six Nationwide races this past season, with four top-20 finishes, including a 13th at Kentucky Speedway. Richard Petty is a seven-time NASCAR champion. "We want to win races for ‘The King,’" Armstrong said in the team’s release. "I’m ready to take the next step in my career and RPM is an organization where I believe I can make that happen. Our team and sponsors are as committed to winning as I am, and I’m looking forward to a successful season and future together." "Dakoda and WinField will help us continue the success of our No. 43 Nationwide Series program," said Richard Petty, a seven-time NASCAR champion and co-owner of Richard Petty Motorsports. "Dakoda is a driver who has grown up in the sport and has paid his dues. He has proven himself at every level, and we will now give him the tools he needs to be successful in the Nationwide Series, and believe he can win races for us." Dakoda is a driver who has grown up in the sport and has paid his dues. Armstrong, who cut his teeth in the USCAC Midget and Sprint Car ranks, is one of a number of promising youngsters moving up through the NASCAR ranks in a talent-rich environment for the younger generation. With Annett at the helm in 2012, the No. 43 RPM squad finished fifth in the final Nationwide point standings. Annett, who drove for RPM in 2012 and ’13, next year will move to the NASCAR Sprint Cup Series, where he will drive for Tommy Baldwin Racing. Annett missed eight races in 2013 after he fractured his sternum in the season-opening race at Daytona.